I read these books when I was first grade and loved them. Rereading the first book was a very weird experience, good and strange at the same time. I enjoyed this book. It’s definitely quirky in a way that probably appealed more to a younger me. It’s clearly the start of a long series in that it feels more like an exposition than a book–which it is, and which is not necessarily a bad thing. The characters are likable if not terribly complex. The book is told in third person (for the most part), which ends up keeping the reader somewhat distant from the characters. I still felt an emotional connection with the Baudelaire orphans, especially the baby, Sunny, who I just wanted to hug through the entire story. 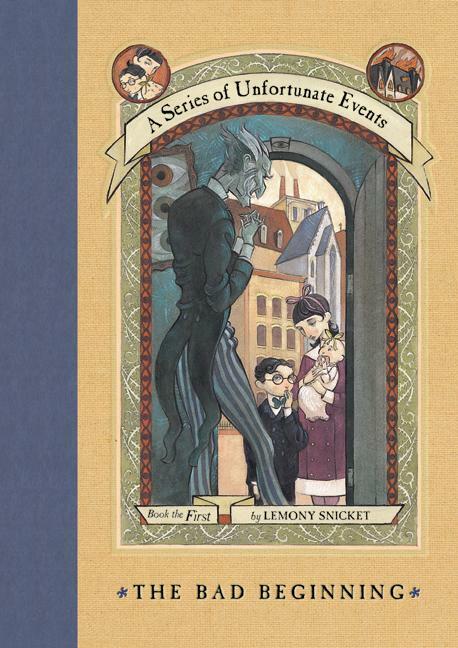 The voice Lemony Snicket brings to the tale is interesting: the story is technically told as if Snicket is telling the account himself, and it occasionally flashes into first person. The voice is melancholy and sassy at the same time–a combination that is hard to describe but entertaining to read at any age. I love the fact that Snicket uses “big” words and then describes the meaning; I remember that it made the books very approachable as a young reader, and it adds to the strong sense of character the narrator possesses. The main difference between my memory of these books and my impression reading them as a sixteen year old is how much the plot emotionally affected me. I have a clear memory of trying to get my grandmother to read the books when I was young and having her say that they were too sad. I remember being seriously confused, because the books struck me as funny and eccentric, not sad. This time, I almost couldn’t get through the book. Count Olaf is abusive–and not in a quirky way–and it freaked me out that I found these books fun as an elementary schooler. I think the difference comes from the fact that I now have context to understand the real life implications of the Baudelaires’ plight–and it is fairly horrific. 52 Letters Just Turned One!